What type of phone do I need to use the app? How do I get Stock Move Express for iPhone? How to setup my NLMD-LT account to work with the phone? How do I import my existing animals? How do I download my animals? How do I connect to the Shearwell Stick Reader? Stock Move Express for iPhone requires an iPhone running iOS version 7.1 and higher. The phone will need internet access via mobile data or Wi-Fi. Stock Move Express for iPhone requires an iPhone or iPad running iOS version 8.0 and higher. The device will need internet access via mobile data or Wi-Fi. How do I get Stock Move Express for iPhone / iPad? Select the 'App Store' icon on your phone. In the search box at the top, search for 'shearwell stock move'. Tap 'Stock Move Express' in the search result and press 'GET'. The button changes to 'INSTALL'; press this and the app will start downloading. On an iPad, you also need to change the setting from iPad Only to iPhone Only. Tap 'Stock Move Express 2' in the search result and press 'GET'. The button changes to 'INSTALL'; press this and the app will start downloading. To use the app, an account with NLMD-LT is required. If you don't have one already, you can create one for free using the app. Enter your name, postcode and the CPH number for a holding that you are responsible for. This will be checked against the given postcode. The email address will be used as your username. If you agree to the terms, indicate your agreement and complete the account creation process. If the CPH and postcode details you enter are valid, account approval can be instant - meaning you will be able to log in immediately. Otherwise you may have to wait for the administrator to approve your account. Login to the NLMD-LT website on your computer and select from the main menu Manage Holdings > Edit Holdings. Select the Edit button for each of the holdings and enter the address and herd / flock numbers. Login to the NLMD-LT website on your computer and select from the main menu My Details > Manage Favourites. Select a favourite type to configure, this could be Holdings you regularly make movement to or from, breeds, herd / flock numbers etc. Continue this process until all the different favourite types have been configured. To get any changed favourites onto your phone, from the app front screen select the settings icon and press 'Refresh Favourites'. To get any changed favourites onto your phone, from the app front screen select the settings icon and press 'Logon/Download'. Then switch on 'Download favourites' and press 'Download'. Login to the NLMD-LT website on your computer and select from the main menu 'Manage Holdings' > 'Import Animals'. Select a holding CPH, species and method of import. Once the import has been completed, you can download the animals to your phone by selecting the settings icon from the app front screen and then pressing 'Refresh Animals'. Once the import has been completed, you can download the animals to your phone by selecting the settings icon from the app front screen and then press 'Logon/Download'. Then, turn on 'Download animals' and press 'Download'. For a detailed guide on how to import animals click here. From the front screen press the settings icon. For details on how to import your existing animals onto NLMD-LT click here. Please note you need an active mobile internet or Wi-Fi connection to complete this action. The app can accept EID's of individual identified animals via Bluetooth from the Shearwell Data EID Stick Reader (SDL440S model). Run the Stock Move Express app and if a message appears telling you to switch on Bluetooth, press 'Settings' and turn on Bluetooth. From the home screen of Stock Move Express, touch the sheep and then touch the animal detail tab at the bottom (the sheep will turn green when selected). You should now see an icon representing the stick reader at the top of the screen. Press on the icon to see the 'Tag Reader' screen. Switch the Stick Reader on, then press 'Add Tag Reader'. The app will now scan for all Bluetooth devices in range. 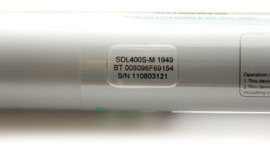 On the back of the stick reader, look for a label with the Bluetooth name. It will start with SDL440S- followed by some digits. For example: SDL440S-1234. Once the scan is complete, you will see the stick reader's Bluetooth name in the list. Select it and press 'Accept'. The phone will indicate that it is connected to the reader (the icon at the top will change) and the Stick Reader's blue light will also shine. From now on, the phone will try to automatically connect to this reader whenever you are on a screen which can accept tag reads. From any screen that uses tag reads: select the 'Tag Reader' button . The tag reader screen contains a list of tag readers known to your app. The first time you visit this screen will be empty and you will need to add your tag reader. The phone will indicate that it is connected to the reader (the icon at the top will change) and the Stick Reader's blue light will also shine. The app settings screen allows you to configure how the app works. To get to the setting screen, press the gear icon at the top of the screen. The settings are grouped into 3 different categories. For synchronising the data stored in the app with the data stored on NLMD-LT.
Logon: Use this to logon to NLMD-LT. Most useful when you have reset your password on NLMD-LT, as the app will need to logon with the new password. Refresh Favourties: Will download (from NLMD-LT) the lists of recently used values like herd / flock numbers, breeds, hauliers etc. Any values entered via the app which have not also been sent in requests to NLMD-LT will be lost. Refresh Lists: Will download standard lists for medicines, breeds, death reasons and treatment conditions. Refresh Holdings: Will download the list of holdings known to your login on NLMD-LT. Any holdings entered via the app which have not been sent in requests to NLMD-LT will be lost. Refresh Animals: Will download the animals on farm along with their movements, treatments and comments. Refresh Standard Medicines: Keep your app up to date with the list of standard medicines. Refresh Medicine Stock: download the medicine stock known to your account from NLMD-LT. If you have added or removed medicines on NLMD-LT then you can use this to bring the app up to date. To set user preferences for the way the screens behave. Custom key click: play a key-click sound when using keyboard-like entry fields. Default species: Go straight to one of the species when the app starts - if you have only cattle setting this to cattle saves having to press the cattle button each time you start the app. Simple Sheep Movements: When ticked, it enables a short version of the movement screen which only collects the information required by the Holding Register. This option should not be ticked if you want to generate movement documents or forward movements to a statutory movement database (i.e. ARAMS, EIDCymru or ScotEID). Show Counts of requests on front screen: The Activities button on the front screen can display the counts of requests Not Ready, Unsent, Needing Action, inside the button. This setting allows you to turn this display off. Fast Menu: Provides a hierarchical menu system for quicker navigation around the features of the app. Read tags in requests: In some requests - those with only one field for entering animals, you can enter animals without activating the animal entry screen. This button allows you to enable/disable this feature. This is not possible for all request screens. Logon/Download: refresh the data on your device with the latest from the server, or reset your password to match a change on the server. Prompt for new animal details: When switched on the app will prompt you for the details of each new animal as you add it. Management Group Filtering: When switched on this will add a button to the top of the Animals list that will allow you to filter the animals by Management Group. You cannot turn on both Management Group Filtering and Holding Filtering at the same time. If you turn on Management Group Filtering when you have Holding Filtering turned on then Holding Filtering will be turned off. Holding filtering: When switched on this will add a button to the top of the Animals list that will allow you to filter the animals by their current holding. You cannot turn on both Holding Filtering and Management Group Filtering at the same time. If you turn on Holding Filtering when you have Management Group Filtering turned on then Management Group Filtering will be turned off. When opening this screen, Your username and current password will be entered for you. You can use the password field to tell the device when you have changed the password on the server. This screen allows you to select multiple actions and then perform them by choosing 'Download' This screen will also appear when refreshing animals, or refreshing medicines. The name of the download button will change but it will still do the same job. When this screen is shown for a specific task (e.g. refreshing animals) you can choose to add other data download tasks. Download animals: Will download the animals on farm along with their movements, treatments and comments. Any local changes which have not been sent in requests to NLMD-LT will not be lost. Download holdings & hauliers: Will download the lists of holdings and hauliers known to your login on NLMD-LT. Any holdings and hauliers entered via the app which have not been sent in requests to NLMD-LT will be lost. Download Favourties: Will download (from NLMD-LT) the lists of recently used values like herd / flock numbers, breeds, hauliers etc. Any values entered via the app which have not also been sent in requests to NLMD-LT will be lost. Download Lookups: Will download standard lists for genders, breeds, death reasons, treatment conditions and similar. Refresh Medicine Stock: download the medicine stock known to your account from NLMD-LT. If you have added or removed medicines on NLMD-LT then you can use this to bring the app up to date. Any local changes which have not been sent in requests to NLMD-LT will not be lost. Animal identifiers can be added to a request (e.g. movement) in four different ways, depending on how you have collected the identifiers. Switch the Stick Reader on. On the phone press 'Press to add animals' in the appropriate recording action e.g. movement. Wait a few seconds for the phone to connect to the stick reader. The title bar of the app will indicate that it is connected and the blue light on the stick reader will switch on. If you haven't connected to the stick reader previously click here for details on how to connect. Tap the stick reader icon and press 'Read Groups'. The app will display a list of groups stored in the stick reader's memory. Tap on each group you want to import. A tick mark appears and indicates which groups will be retrieved from memory. When you have ticked all the desired groups, press 'Add Groups'. Wait a few seconds for the phone to connect to the stick reader. The title bar of the app will indicate that it is connected and the blue light on the stick reader will switch on. If you haven't connected to the stick reader previously, click here for details on how to connect. Now read an EID using the stick reader and it should be added to the animal list. On the phone press the 'Manual Tag' button. Select the herd/flock number, if the herd/flock number does not exist in the list, press the 'New Herd/Flock' button and enter the number e.g. 123456. Enter the tag number. As you type the app will automatically add zero padding and calculate the check digit for cattle. E.g. for tag UK123456 300101 just enter 101 and the phone will automatically add any zero padding and the check digit. Press 'Add Tag' or 'Add Tag and Exit'. The first will add the tag to the list and wait for you to enter the next tag, the second will take you back to the list of tags already entered. Enter the last few significant digits of the tag number and suggestions will appear showing known animals on holding. E.g. for animal UK123456 300101 just enter 101 and the app will display suggestions of all animals on holding with tags ending with 101. Select the desired tag from the list of suggestions. Enter the tag number. As you type the app will automatically add zero padding and calculate the check digit for cattle. E.g. for tag UK123456 700105 just enter 105 and the phone will automatically add any zero padding and the check digit. This method can be used if the animals are batch identified or you are only required to record the event on a batch basis. On the phone press 'Add Batch'. Select the flock number from the recently used list. If you cannot find it press 'New Flock' and enter the flock number. If you need to select a stock type and Id Mark, press 'Details'. Press 'Add Batch' to add the batch to the list. Tap the stick reader group read icon and select the desired stick reader from the list shown by the app. The app will display a list of groups stored in the selected stick reader's memory. Tap on each group you want to import. A tick mark appears and indicates which groups will be retrieved from memory. When you have ticked all the desired groups, press 'Use tags'. Press 'Animals' in the appropriate recording action e.g. movement. If you have not used the the herd/flock number before, press the 'New Herd/Flock' button and enter the number e.g. 123456. Press back. Press the 'Add Animals' button. On the phone press 'Batches'. Data recorded will not appear on your NLMD-LT holding / herd register until it is sent to NLMD-LT.
⊕ Plus sign: The animal is included in a request that will result in it being created when the request has been successfully sent. E.g. an on movement or any request where the animal has not been seen before. This is important because any subsequent request for this animal cannot be 'sent' until the creating request has been sent. ⊖ Minus sign: The animal is included in a request that will result in it being deleted when the request has been successfully sent. E.g. an off movement or death. This is important because the animal cannot be added to any other requests, and cannot be 'selected' (ticked) in the animal list. ✎ Pencil: The animal is included in a request that will neither create nor delete it when the request is successful. This is included to indicate that it has outstanding activity. A list of the requests which have not been sent can be viewed by selecting the animal and choosing the 'Activity' tab. After recording a request press 'Send'. This will save the request to your phone, which will try to immediately send it to NLMD-LT. To use this option you need mobile internet signal or a Wi-Fi connection. If trying to send fails due to lack of signal the request will be saved locally and you will be able to try to send it again later from the 'Activity' list. or by pressing the synchronise button on the home screen. You can select each request you want to send and press 'Send' or you can press the send all button. The Activity list groups the requests into categories indicating the type of the result and what you can do about it. A category may contain many different types of request, for any species. For example you might have 'Unsent' requests for a Medicine Purchase, a Cattle Treatment, and a Sheep Movement. Each category is expanded by pressing on it, so that you can see the requests in the category. Each request can be further examined by pressing on it. Many of the categories also have a button on the right that performs on all the requests in the category the most likely action that you might wish to perform. Sending - these requests are currently being sent. Open the category to view the list of requests in this state, and click on a request to view it. Requests are not editable in this category, and there is no category action. The requests in this category will be recategorised once the result of the send has been received. Failed to send - these are requests that the app has been unable to send to the server, usually because the internet was not available, sometimes because you are not correctly logged in. Open the category to view the list of requests in this state, and click on a request to continue editing it. The category action button allows you to resend all the requests to the server. Sometimes requests will appear briefly in this category, before disappearing again. This is because the app will try to send them each time it successfully logs on to the server. Rejected - These are requests that you have sent to the server, but that the server has rejected. Open the category to view the list of requests in this state, and click on a request to continue editing it. Complete with errors - Requests in this category have finished but have errors. Open the category to view the list of requests in this state, and click on a request to examine it. The action for this category is to delete all the requests. Complete with warnings - Requests in this category have finished but have warnings. Open the category to view the list of requests in this state, and click on a request to examine it. The action for this category is to delete all the requests. Unforwarded - These requests have been sent to the server, but the server suggest that you may want to forward them to the relevant statutory database. The category action is to forward them all, but you can open the individual requests to individually send or cancel . Forwarding - Requests that the server reports as being forwarded . The category action is 'Refresh All', which asks the server if the forward has completed yet. Unsent - These requests have enough information to send to the server but have not been sent. Open the category to view the list of requests in this state, and click on a request to continue editing it. The category action button allows you to send all the requests to the server. Not ready to send - These requests have been started, but there is insufficient data in them to send them to the server. Open the category to view the list of requests in this state, and click on a request to continue editing it. Complete - Requests in this category have finished without any errors. Open the category to view the list of requests in this state, and click on a request to examine it. The action for this category is to delete all the requests. The synchronise button on the home screen has three numbers to indicate the number of requests in a category which you must do something about. The diagram below shows each number&apos;s location, colour and meaning. You will also see a number in the CLOUD shown at the top of the animal list screen. The number will be flashing with the count of request responses from NLMD-LT that require user input. If the number is not flashing, the responses are for user notification only. Sheep movements can be forwarded to the relevant statutory database. In England this is ARAMS, in Scotland it is ScotEID and in Wales it is EIDCymru. To enable this, you must first configure the relevant forwarding details for ARAMS, EIDCymru or ScotEID. To forward a request you then just record and send the request to NLMD-LT as normal. When the request is successfully sent, a message will appear asking if you want to forward the request and give you three options: now, later or never. 'Now' will trigger the request to be immediately forwarded to the indicated statutory database. 'Later' will not forward the request, you can trigger it to be forwarded via the NLMD-LT website or by selecting the request from the list shown after tapping the 'Activity' icon on the app toolbar (the envelope with the number of active alerts). In the Activity list, you can select and forward individual requests or forward all using the forward all button. 'Never' will not forward the request, but the data recorded will still appear in your holding register. If this message doesn't appear, the request has not been forwarded. This could be because you have not set up forwarding for the particular holding involved or you are sending animals to a market or collection centre in England. You can print a completed movement document form by logging in to the NLMD-LT website and selecting Reports > Movements. When NLMD-LT receives a response from the statutory database, it will send a notification to the device running the app. Notifications appear on the lock screen or can be found by swiping down from the top of the screen. Press (or swipe when on the lock screen) the notification message and the app will be loaded with details of the movement request. For successful movements you will see the relevant statutory database forwarding IDs but for failures you will see the request id and the list of errors. If errors have been reported, you will need to log in to the NLMD-LT website and select Manage Holdings and then Send / Review Result for the relevant statutory database. If you are in England, see the sending to ARAMS guide, or in Scotland, see the sending to ScotEID guide or in Wales, see the sending to EIDCymru guide. Cattle births, movements and deaths can be forwarded to BCMS but before this can be done you must setup BCMS. To send a request to BCMS, record and send the request to NLMD-LT as normal. When the request is successfully sent you will be asked if you want to forward to BCMS and given three options to send: now, later or never. 'Now' will trigger the request to be sent to BCMS immediately. 'Later' will not send the request to BCMS, you can trigger it to be sent via the NLMD-LT website or by selecting the request from the list shown after tapping the 'Activity' icon on the app toolbar (the envelope with the number of active alerts). In the Activity list, you can select and forward individual requests or forward all using the forward all button. 'Never' will not send the request to BCMS, but the data recorded will still appear in your herd register. If this message doesn't appear, the request has not been forwarded to BCMS. This could be because you haven't setup BCMS for the particular holding involved or NLMD-LT found errors with the request. Requests aren't sent to BCMS immediately and BCMS sometimes take up to 24 hours to process and return the result. When BCMS have processed your request, NLMD-LT will send a notification to the app informing you of the result. Notifications appear on the lock screen or can be found by swiping down from the top of the screen. Press (or swipe when on the lock screen) the notification message and the app will be loaded with details of the request. The result notification contains the BCMS Receipt ID and BCMS status, if the BCMS status is success and there is a receipt ID it means the request was successfully sent to BCMS. If BCMS reported error, details of the errors reported will be shown. To resolve any errors you will need to login to the NLMD-LT website and select Manage Holdings > BCMS > Send / Review Result, for details see the sending to BCMS guide. If you don't receive a notification of the BCMS result within 24 hours, you should manually check the BCMS status by selecting the 'Activty' list, then the appropriate request then press the 'Refresh' button. You can refresh all 'Forwarding' requests by pressing the refresh all button. If you have cattle, the app / NLMD-LT can send any births, movements and deaths to BCMS. You will need to have registered to use the BCMS CTS Online Service to obtain your username and password. The setup of BCMS reporting is done via the NLMD-LT website. For a detailed guide on how to configure and use BCMS click here. On the Cattle record tab, select 'Birth'. Set the tag application date, date of birth and choose the holding CPH where the calf was born. Press Birth Dam, then either scan the dam with your stick reader or press Manual Tag and enter the details (see the section on manually entering tags). Press Calf Tag and optionally Birth Sire in the same way as the dam tag. Select the breed and gender from the drop down list. You can now save or send the request. In the cattle view, select 'Create request' and then 'Birth'. Scan the dam device, and confirm in the dialogue that this is indeed the dam device, or press on 'Dam' and maunully enter th dam device. Optionally set the Birth Sire tag. Optionally set the Genetic Dam tag. Press on offspring and add the offspring tags to the list. On the Cattle record tab, select the appropriate 'Movement' (i.e. depending on whether this is a within business, on or off move). Select the departure and destination holding CPH. If you cannot find a particular holding within the list, tap 'New' and enter the holding CPH, name, type and contact details. Press 'Press to add animals' to record the tag numbers of the animals moved. Optionally select the haulier name and vehicle registration number. Press 'Animals' to record the tag numbers of the animals moved. On the Cattle record tab, select 'Death'. Select the date of death and holding CPH where it happened. Select how you disposed of the carcase. You can either choose 'Specify disposal holding' and enter a holding CPH or enter a comment in the 'Approved Disposal Route' field. Choose, or enter a new death reason. Press 'Press to add animals' to record the tag numbers of the animals which died. In the cattle view, select 'Create request' and then 'Death'. Press 'Animals' to record the tag numbers of the animals which died. On the Cattle record tab, select 'Tag Replacement'. Select the tag replacement date and holding CPH where it happened. Select the replacement reason and optionally enter a comment. Press 'Press to add replacements' in order to enter details about the tags replaced. Enter the replacement tag number by pressing 'Scan Tag' to read the tag's EID or 'Manual Tag' to enter it manually. Press 'Add to list' to add the selection. If you are replacing multiple tags the above process can be repeated. Once the replacement identifiers have been added press 'Back'. In the cattle view, select 'Create request' and then 'Tag Replacement'. Press 'Touch to add replacements' in order to enter details about the tags replaced. Enter the old (replaced) tag: either scan a tag with the stick reader, or press 'OldTag' to enter the the number manually. In the manual tagger there is an option 'Unknown' to use when you do not have or know the old tag number. Enter the new (replacement) tag: either scan a tag with the stick reader or press 'New Tag' to enter the the tag number manually. Press 'Add to list' to accept the replacement. The screen returns to its initial appearance, ready for you to enter the next old/new tag pair. On the Cattle record tab, select 'Medicines' > 'Administer Treatment'. Select the holding CPH where the animals were treated, and the treatment start and end date. Next press 'select medicine'. The medicine list will initially show all Stock Medicines that you have previously purchased. If you don't want to use the medicine purchase / stock feature press the 'Standard Medicines' button to just choose from the apps list of common medicines. Enter the dosage administered per animal. Optionally, select the person who administered it and the condition. Press 'Press to add animals' to record the tag numbers of the animals. In the cattle view, select 'Medicines' and then either 'Stock Treatment' or 'Standard Treatment'. Select the medicine that you wish to use. The request editor will now appear with the medicine entered. Press 'Animals' to record the tag numbers of the animals. On the Cattle record tab, select 'Medicines' > 'Medical Procedure'. Select the holding CPH where the animals were treated, treatment date and procedure performed on the animals. Optionally select the person who administered it and the condition. In the cattle view, select 'Medicines' and then 'Procedure'. You can use comments (notes) to group animals or record that something has happened to particular animals. On the Cattle record tab, select 'Comments'. Select the holding CPH where the animal is located. Enter the comment text to be applied. Optionally select a colour indicator flag. Use this to group comments into categories e.g. Maybe use the red flag for animals marked for culling or orange for animals with a particular ailment. If you want a warning icon to be displayed next time you read or enter the tag, press on the warning icon. In the cattle view, select 'Create request' and then 'Comments'. You can view comments within the animal details screen, or when adding animals to an event (e.g. treatment) you will see any comment colour flags within the tag list and pressing on the flag icon will display all comments. From the main view choose 'Cattle' and then 'Add Weight'. Select the holding where the weight was recorded. Select the date of the weighing - this will default to today. You can now add weight records for the animals either by scanning a tag or by pressing the '+' button. When you have recorded the weights you can now save or send the request. From the main view choose 'Cattle' and then 'Groups'. This will bring up a list of the management groups. Pressing on a group in the list will allow you to view the details. If you press on the 'Edit Group' button you can create a request that will edit the details of the group. To create a new group press on 'New Group'. Sheep tag application / births can be recorded in two ways. Simple mode can be used if you want to record a group of sheep of the same breed that were born in the same month and year. Otherwise you can use the management info mode to record details such as gender, breed, dam and sire for each individual animal. On the Sheep Record tab, select 'Tag Application'. Select the tag application date and holding CPH where it was applied. Select the year and month the animals were born. Optionally select the breed and enter a comment. On the Sheep record tab, select 'Birth with Pedigree'. Select the holding CPH where the lamb was born, tag application date and date of birth. Press Lamb Tag and optionally Birth Sire in the same way as the dam tag. Open the Advanced info box if you wish to record the animal as breeding stock or an embryo transfer. In the Sheep view, select 'Create request' and then select 'Tag Application'. In the Sheep view, select 'Create request' and then select 'Birth'. Set the tag application date, date of birth and choose the holding CPH where the lamb was born. If you have sheep in England, you can configure the app / NLMD-LT to send your sheep movements to ARAMS. You will need to have registered with the ARAMS website to obtain your ARAMS username and password. The set up of ARAMS reporting is done via the NLMD-LT website. For a detailed guide on how to configure and use ARAMS click here. If you have sheep in Wales, you can configure the app / NLMD-LT to send your sheep movements to EIDCymru. You will need to have registered with the EIDCymru website to obtain your EIDCymru username and password. The set up of EIDCymru reporting is done via the NLMD-LT website. For a detailed guide on how to configure and use EIDCymru click here. If you have sheep in Scotland, you can configure the app / NLMD-LT to send your sheep movements to ScotEID. You will need to have registered with the ScotEID website to obtain your ScotEID username and password. The set up of ScotEID reporting is done via the NLMD-LT website. For a detailed guide on how to configure and use ScotEID click here. Sheep movements can be recorded in two different modes, by default it is configured to allow you to enter the details on the sheep movement document. If you just want to record the data required by the holding register you can switch to the simple version by selecting Settings then turning on 'Simple Sheep Movements'. Sheep movements must also be sent to the relevant statutory database. In England this is ARAMS (Animal Reporting and Movement Service), in Scotland it is ScotEID and in Wales it is EIDCymru. If you have correctly configured the forwarding settings for NLMD-LT, sheep movements will be forwarded to the correct statutory database after sending it to NLMD-LT. You should not use simple sheep movements if you want to report movements to a statutory database. On the Sheep Record tab, select the appropriate 'Movement' (i.e. depending on whether this is a within business, on or off move). Select the departure and destination holding CPH. If you cannot find a particular holding within the list, press 'New' and enter the holding CPH, name, type and contact details. If you are adding a new destination or departure holding, enter the full address of that holding. You only need to enter departure keeper details if these are different from the ones entered for the selected departure holding. If the animals are being consigned to slaughter you can confirm the FCI statement or you can select 'FCI statements are not satisfied' and enter additional FCI information at the bottom of the form. Select the loading and departure date/time, and the duration of the trip. Tick who is responsible for transporting the animals then select the vehicle registration number. For Destination Details tick the box if the move is to a slaughterhouse or isolation unit. If the movement is on to one of your holding enter the number of animals received, arrival and unloading date/time. Tick the box if the keeper information of the destination holding is the same, or enter new keeper details. You can now save or send the request. If you save the request, it will appear under the "Unsent" category of the Activity list and you can send it from there at a later date. If you are configured for statutory forwarding, after a sheep movement request is sent to NLMD-LT a new screen will ask if you wish to also forward the movement to the relevant statutory database. You can print a completed movement document form by logging in to the website and selecting Reports > Movements. To make it easier for you to select holding and haulier details within the app, use the configure favourites page on NLMD-LT.
You can enter the details required on the sheep movement document. These are the 'On move', 'Off move', and 'In-business move' options. You can just record the data required by the holding register. These are the 'Simple on move', 'Simple off move', and 'Simple in-business move' options. You should not use simple sheep movements if you want to report movements to a statutory database. Sheep movements must also be sent to the relevant statutory database. In England this is ARAMS (Animal Reporting and Movement Service), in Scotland it is ScotEID and in Wales it is EIDCymru. If you have correctly configured the forwarding settings for NLMD-LT, sheep movements will be forwarded to the correct statutory database after sending it to NLMD-LT.
On the Sheep Record tab, select 'Death'. Select how you disposed of the carcass, you can either tick 'Specify disposal holding' and enter a holding CPH or enter a comment in the 'Approved disposal route' field. Select or add a reason for the death. Press 'Press to add animals' to record the tag numbers of the animals that died. You can now save & send the request. In the Sheep view, select 'Create request' and then select 'Death'. Press 'Animals' to record the tag numbers of the animals that died. On the Sheep Record tab, select 'Tag Replacement'. In the Sheep view, select 'Create request' and then select 'Tag Replacement'. Enter the new (replacement) tag: either scan a tag with the stick reader or press 'New Tag ' to enter the the tag number manually. On the Sheep record tab, select 'Medicines' > 'Administer Treatment'. In the sheep view, select 'Medicines' and then either 'Stock Treatment' or 'Standard Treatment'. On the Sheep record tab, select 'Medicines' > 'Medical Procedure'. In the sheep view, select 'Medicines' and then 'Procedure'. On the Sheep record tab, select 'Comments'. In the Sheep view, select 'Create request' and then select 'Comments'. From the main view choose 'Sheep' and then 'Add Weight'. From the main view choose 'Sheep' and then 'Groups'. This will bring up a list of the sheep management groups. Pressing on a group in the list will allow you to view the details. If you press on the 'Edit Group' button you can create a request that will edit the details of the group. In stock: This is a list of all the medicines that are calculated to be in your medicine stock. A medicine is 'in stock' if we calculate that you have some left (more than zero of whatever units the medicine comes in). The calculations are based on the purchase, treatment and disposal records that you have submitted, and that are known to this device. Selecting a medicine in a list will display details for the medicine. If you 'long press' on a medicine in this list then you will be presented with a choice of actions that you can perform with the medicine. There are several ways this list can become innacurate, for example you forgot to record a disposal, or a treatment was recorded on another device and you have not refreshed your device from the server. If you cannot find the medicine in this list, then look in the history list instead. History: This list contains all known medicines that you have used whatever the calculated stock level. Selecting a medicine in this list will display details for the medicine. If you 'long press' on a medicine in a list then you will be presented with a choice of actions that you can perform with the medicine. To purchase: This list contains an extensive selection of medicines from the Veterinary Medicines Directorate's Product Information Database. Selecting a medicine in this list will display a choice of actions that you can perform with the medicine. If you think that medicines are missing, press 'Refresh' to download an up to date list from NLMD-LT.
To add a medicine not listed in the 'To purchase' list press '+Other'. On the front screen, select the Medicines button. Select the medicine by pressing the 'Select Medicine' button. This list is populated by a recent download from the Veterinary Medicines Directorate (VMD). If you cannot find a medicine or the withdrawal period displayed is different to the box, press 'Non-Standard Medicine' and fields will appear allowing the medicine name and withdrawal details to be entered. Next select the holding the medicine was purchased for and purchase date. Now enter the medicine batch number, supplier, expiry date and amount purchased. You can now save or send the request, you will not be able to treat animals with the medicine until it is sent to NLMD-LT.
Press 'To purchase'. This displays a list of medicines recently download from the Veterinary Medicines Directorate (VMD). Select a medicine by pressing it. Press either 'Record a purchase' or 'Record a purchase with altered details'. 'Record a purchase with altered details' allows you to alter the withdrawal periods for the medicine. On the front screen, select the 'Medicines' button. The screen shows a list of all stock medicines, you can press on a medicine for further details and options. If medicine stock records are missing or out of date press 'Refresh' to download an up to date list from NLMD-LT.
To dispose of a medicine, press on the medicine to dispose, then press the 'Dispose' button. Enter the disposal date, reason and method. To dispose everything in stock tick 'Dispose of all remaining', otherwise enter the disposal amount. Press either 'In stock' (for all stock medicines with some remaining) or 'History' (for a list of all stock medicines). If medicine stock records are missing or out of date press 'Refresh' to download an up to date list from NLMD-LT.
You can press on a medicine for further details and actions, or you can 'long press' to go straight to the 'Actions' menu . To dispose of a medicine, press on the medicine to dispose, then press the 'Action' button. Press on either 'Dispose of all remaining' or 'Dispose of some'. The sheep/cattle list screen allows you to see all your sheep/cattle. A very short description of each animal is presented in a scrollable list. Pressing on one of these descriptions will take you to the details for that animal. The details for the animal is organised into four tabs: Details, Comments, Movements and Treatments. If there are alerts or comments associated with an animal then the coloured icons are displayed next to the animals tag number. Pressing on these icons will take you directly to the comments tab of the animal details. If you have a stick reader connected and scan a tag for an animal in the list then you will be taken straight to the details for that animal. Press the 'Filter' button to show only the animals matching a filter criterion. You can enter any search text that you choose, and the press 'Animal Id' to find animals whose tag contains the search string. Or you can choose 'Animal Comment' to find animals which have a comment containing the text. Press the 'Find' button to search for an exact tag. The screen works just like the manual tag input screen to help you locate an exact animal quickly. When you have located an exact animal, 'Find' takes you to the animal details. Pressing the 'Select' button take you into selection mode. In this mode you can select several animals. When you enter selection mode an additional toolbar appears at the top of the animal list. Selected animal are marked with a tick. Selecting 'Cancel' on this toolbar returns to normal mode. By touching an animal you can toggle its selection on and off rather than displaying the animal details. Tag reads will select animals in the list, and you can even read a list of tags from groups in the Stick Reader's memory, and any matching animals will be selected. You can also enter selection mode by doing a 'long press' on an animal. In this case the animal is selected when you enter selection mode. When you have selected your animals you can press continue to apply an action such as 'add comment' to the selected animals. The request editor will appear, with the animals already added to the request. When used in conjunction with filtered comments this can become a very powerful way to quickly apply actions to groups of animals. In selection mode there are further options available by clicking the animal count. 'Select all' and 'Deselect All' are fairly obvious. 'Show Selected' applies a filter to the view that shows only the animals that you have selected. 'Show All' removes this filter. If animals are missing, press 'Refresh' to download an up to date list from NLMD-LT. The sheep/cattle list screen allows you to see all your sheep/cattle. A very short description of each animal is presented in a scrollable list. Some animals in the list might have a ⊕, ⊖ or ✎ after the number and these indicate the animal is involved in an unsent request (see save or send for more details). Pressing on one of these descriptions will take you to the details for that animal. The details for the animal is organised into five tabs: Details, Comments, Movements, Treatments and Activity. If there are alerts or comments associated with an animal then the coloured icons are displayed next to the animals tag number. Pressing on these icons will take you directly to the comments tab of the animal details. If animals are missing, press 'Refresh' button to download an up to date list from NLMD-LT. If you have turned Holding Filtering on then pressing on the green button will provide a picker so you can select a holding. Only sheep/cattle currently on the holding will be shown in the list. If you press 'Cancel' instead of selecting a holding then no holding will be selected and you will see all sheep/cattle. Holding Filtering can be used in conjunction with Filtering Animals, described below. If you have turned Management Group Filtering on then pressing on the green button will provide a picker so you can select a Management Group. Only sheep/cattle currently in the Management Group will be shown in the list. If you press 'Cancel' instead of selecting a Management Group then no Management Group will be selected and you will see all sheep/cattle. Management Group Filtering can be used in conjunction with Filtering Animals, described below. 'Tag starts with': to find tags that start with your search string. 'Tag ends with': to find tags that end with your search string. 'Tag contains': to find tags that contain your search string anywhere inside. 'Comment contains': to find all the animals that have a coment containing your search string. 'Cancel': to exit and do nothing. Note that all searches are case insensitive ('A' is the same as 'a'). You can select several animals and then perform an action on them, such as treating them or adding a comment. You can even start selecting animals after you have filtered them. When used in conjunction with filtered comments this can become a very powerful way to quickly apply actions to groups of animals. To start selecting animals either press the 'Select' button or 'long press' on an animal that you want to be part of the selection. The bottom toolbar will then change to give you extra options. Pressing the 'Unselect' button will stop selecting animals, forget what you selected, and return to the normal browsing mode. If you have not selected all the animals then a button appears to allow you to do so. If you have selected all the animals this button will change to allow you to clear the selection.